Versatile natural stock for Japanese, Western or Chinese dishes. A good nutritious broth. 100% natural ingredients. A multi purpose stock powder seasoning without added fat, salt, sugar or chemical additives. Dashi is the backbone of so much Japanese cuisine, as it imparts a mouth-filling umami taste to dishes. -How to store: Keep dry and avoid heat and direct sun light. -Best before date: 2 years from production date. After opening, seal in an air tight container and consume as soon as possible. 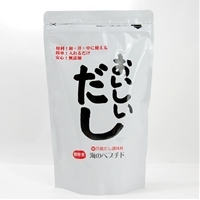 -How to use: Dissolve 10g dashi-powder into 200cc of hot water. Use this broth for miso soup stock or take it as a nutritious broth. You can also sprinkle on stir fries, noodles or stew as a seasoning.